The classic tale of kindness to animals and animal kindnesses trots, crawls and flies onto the stage in a big Broadway-sized family musical. 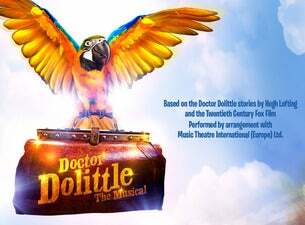 All of the characters (human and animal) we have come to love through the stories of Hugh Lofting and the magical movie musical are given new life in the stage version of Doctor Dolittle. With lavish settings, spectacular effects and an Oscar award-winning score that includes the hits 'If I Could Talk To The animals' and 'I've Never Seen Anything Like It', Doctor Dolittle is the perfect treat for all the family!